The start of something big. This picture shows a happy Hans Stuck after his successful world record attempts on the Avus. Behind him a proud Rennleiter Willy Walb. After these record attempts Auto Union entered all great races on three continents until 1939, turning their cars into the only successful rear-engined Grand Prix machines for decades to come. Over the years, there have been numerous innovations coming over from motor racing to road-car design and technology. One of them - and a very significant one at that - is notably lacking from that list. Well, almost, if we momentarily discount a small niche of priceless road-going sportscars. You guessed it - it's the aft-mounted engine lay-out. In fact, if there's one innovation responsible for the increasingly widening gap between the looks of the average road car and that of a pukka single-seater, prototype or racing sportscar, it must be the rear-engined revolution. We look at how the revolution started, then caved in for decades, only to pioneered by frowned-upon outsider engineers, before it finally took off and conquered Grand Prix, Indy and sportscar racing. It used to be simple distinguishing a Grand Prix car from a road car - the road car had fenders. Then, somewhere down the roaring twenties, they started moving apart. It’s not just that the mechanic fell off, the cars started to look differently. Streamlining started to take effect, the rapidly increasing knowledge of aerodynamics coming over from the burgeoning aircraft industry. One man, however, was way ahead of them all, introducing his aero-inspired, streamlined Tropfenwagen at the German Auto Exhibition in Berlin. With a mid-engined lay-out to boot. It was as early as 23 September 1921. It was a surprise to say the least, to see such a machine being conceived and built in war-struck Germany instead of being a product of flourishing US economy. It was the brainchild of Viennese engineer Edmund Rumpler, who started his career with the Nesseldorfer Waggonfabrik (the Bohemian company predecing Tatra in the current Czech town of Koprivnice) and the Berliner company Allgemeinen Motorwagen Gesellschaft before moving to Frankfurt in 1902 to start work at Adler. A year later he was the patent-holder of the swing axle which would become such a vital ingredient of 20s and 30s automobile construction. Rumpler returned to Berlin in 1906 to start his own company, freelancing as an engineering consultant to the automotive and aviation industry. Four years later he acquired the rights to fellow Austrian Igo Etrich’s Taube (‘dove’) airplane and started building it in large numbers as the Rumpler-Taube, eventually employing some 3,000 workers in two factories at Berlin-Johannisthal (the later home of the East-German EMW/DAMW racing effort) and Augsburg. With Germany losing the war and being prohibited from manufacturing aircraft, Rumpler turned back to automobiles, founding the Rumpler Motoren Gesellschaft GmbH – but the aviational inspiration remained. His teardrop-shaped Tropfenwagen Typ 0A 104 was the star of the show at the Deutsche Automobil-Ausstellung, as its streamline, its winged fenders and its rearward arrow-banked W6 engine (commissioned from Siemens & Halske) took everybody’s breaths away. But nobody actually wanted to buy it! The aero shape was just too far ahead of its time while it didn’t help that the over-engineered 36hp water-cooled engine was unreliable and through its position behind the driving seats was taking away vital storage space. Rumpler entered into a licensing deal with Benz in 1925 to place Benz’s 2.6-litre 50hp engine in the back, and converted back to traditional fenders too to create the Typ 4A 106 follow-up, even switching to front-wheel drive as a last resort, but it was too little (or perhaps too much) too late. The remaining Tropfenwagen, of which only a hundred were built, were sold off cheaply to Berlin taxi drivers while the rest of them were ritually burned to the ground at the end of Fritz Lang’s famous masterpiece Metropolis, having been sold at bare value to movie company UFA. That was long after Rumpler’s first dealings with Benz & Cie of Mannheim, which was all over Rumpler’s design soon after its first appearance in 1921. This was largely due to the vision of Benz’s Berlin representative, Willy Walb – and if anyone jumps up at the name they are right. Walb was to become the first Rennleiter of Auto Union’s famous racing department of the thirties, where he linked up once again with Dr Ferdinand Porsche and was the first to test-drive Porsche’s prototype. Both were involved in the creation of the Benz Tropfenwagen as well. It was the great German marque’s take on Rumpler’s original design, having licensed it as early as 1922 with an eye on using it for competition purposes. Its hoped-for race wins on Sunday could then act as a front for more sales on Monday, since Benz's image was starting to lack a certain pizazz. Led by chief constructor Hans Nibel, the Benz set to work on the Typ-RH Tropfenwagen (Benz making no qualms in 'lending' Rumpler's name), with RH probably standing for Rennwagen mit Heckmotor (‘racing car with rear engine’). Its small 6-cylinder 2-litre engine – sporting such innovations as double overhead cams and 4 valves per cylinder – produced a mere 90hp but its weight was considerably lower at 750kgs, with minimal unsprung weight due to its inboard drum brakes. 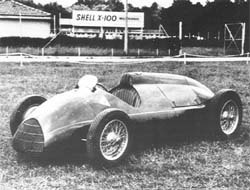 The result was the first rear-engined racing car designed for serious international competition. Not the first per se however, as it was preceded by such relatively minor efforts of the 1920 Brooklands AV cyclecar, which had the engine all the way at the back, and the 1921-'22 Crouch cars, which were designed with a mid-mounted engine (so with the engine behind the driver but in front of the rear axle). That was the same arrangement that Nibel and his co-engineer Max Wagner adopted and is what grew out to be the commonly used single-seater lay-out of the past half century. Another fresh feature was the transaxle configuration of a gearbox mated directly to the differential, as is seen in front-wheel drive cars today. This was bolted onto a 2-litre, 6-cylinder engine with double overhead camshafts carrying four valves per cylinder. At the bottom was a Hirth crank while fuel was carburetted by two Zenith units, the engine eventually delivering a modest 80hp at 4500rpm. The Benz teardrop shape was significantly different from the zeppelin-style Rumpler coachwork but it was still very much a teardrop - even more so than the Rumpler's perhaps. Eyeballed for the 2-litre formula of 1922-'25, the Tropfenwagen ran during 1923 and 1924, debuting at the Italian GP on 9 September 1923. Willy Walb retired with a broken engine while Nando Minoia and Franz Hörner finished 4th and 5th respectively, having to give way to the supercharged Fiats of Carlo Salamano and Felice Nazzaro while 1921 French GP winner Jimmy Murphy snuck ahead of them too for Miller. 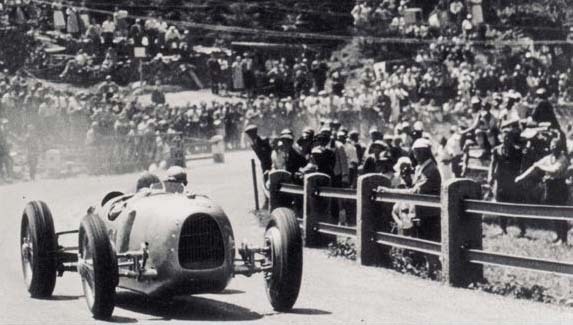 After a handful of hillclimb victories by Walb and later Mercedes works driver Adolf Rosenberger, with Walb also being moderately successful in a sportscar version, the car bowed out a year later after the Solitude GP. While it was praised for its innovation during its brief career, the lack of true success meant that a road-car version was never on the cards. When Benz merged with Daimler in 1926 the entire project was canned in favour of the new conglomerate’s bread-and-butter, its big Mercedes limousines. Meanwhile chief designer Ferdinand Porsche set about drawing a new small car, the W01, before leaving Mercedes-Benz for Steyr in 1928. The rear-engined concept and Rumpler's swing axle were going with him, never leaving his mind again. Porsche’s stay with Steyr was shortlived as the company was soon taken over Austro-Daimler in 1929. The doctor then set up his own engineering firm in Stuttgart in 1930, called Dr.Ing. h.c. F. Porsche GmbH, and was soon fully geared towards a racing programme with Wanderer, having drawn up a contract with Wanderer Werke during the Paris Salon of 1931. For this Porsche founded the Hochleistungsfahrzeugbau GmbH during the autumn of 1931, which would accompany the car’s development until it was finished to go on track. Being a AIACR member, Dr. Porsche had been working on his design a long time before the company was founded, and used his input into the new Grand Prix formula to design a car that would be a perfect match for the 750kgs maximum-weight regulations, which were to be introduced in 1934. The original P-Wagen’s plans were laid out to the Wanderer board on 15 November 1931. They centered around an ambitious supercharged 4.4-litre V16 placed behind the back of the driver. It was bold and brash, and it was certainly new to the Wanderer people. For Porsche himself, of course, it wasn’t, for his design carried on where the Benz Tropfenwagen left off. However, the plans were put on hold initially while Wanderer merged into Auto Union in 1932, the Porsche contract now carried over to the new company. With recession taking its toll on the German population the development of a new supercar seemed slightly at odds. This all changed dramatically when the NSDAP won the 1933 general election and its leader Adolf Hitler was appointed Chancellor. Suddenly money was no object when it came to promoting the glory and prowess of Germany in the rest of the world. However, the persuasive skills of Porsche, Hans Stuck and AU director Von Oertzen were still needed for the Führer to direct some funds away from Mercedes and move them to Zwickau. In a year’s time a prototype was tested on AVUS and at Monza before three world speed records were crushed. Then the team embarked on its first full season of Grand Prix racing. The man in question was Wifredo Ricart, the willful designer at Alfa Romeo, which had seen its previous 8, 12 and 16-cylinder counter efforts against the almighty Germans fail miserably. Alfa Corse were also running terribly late with their latest Grand Prix challenger, the 162, which later turned out to be stillborn. And then the new 1.5-litre s/c GP regulations for 1941 onwards became known. There was initial scare, as Mercedes had upstaged the competition by winning the 1939 Tripoli GP out of the blue with their W165s, and this was blown up into a real fright when the new 'baby' Auto Union Type-E was rumoured to have an engine capable of producing well in excess of 300hp at a crank speed of 9000rpm. Clearly the then serving Alfa voiturette, the highly successful 158 'Alfetta' with its straight-eight engine only producing 225hp at 7600rpm, wasn't going to be a match. Drastic measures were needed. 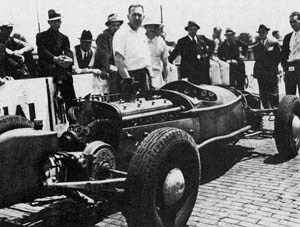 Of course everybody at Alfa Romeo knew of the handling difficulties that a rear-engined lay-out presented, and that it needed a special talent such as Rosemeyer to eek out the full potential of the car, especially with the driver having to sit far forward in the nose, unable to quickly feel the handling changes that a swing-axled rear suspension would transfer to him. Still, the intrinsic advantages of an engine positioned behind the driver had become apparent to Ricart, the Spaniard who had succeeded Lancia-bound Vittorio Jano as the Portello design team's top man. 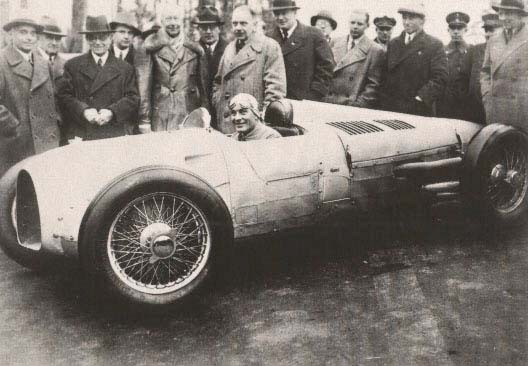 Amongst others, his crew consisted of the talented Gioacchino Colombo, who had been responsible for the Alfetta and later joined Ferrari and the revived Bugatti team (more on that in part 2), and Luigi Bazzi, who did the famous Bimotore. Ricart entrusted the former with the detailed design of the rear-engined car. So when the new 1.5-litre supercharged Grand Prix formula was laid down, Colombo drew an Auto Union Type D-inspired racing car to rival the Mercedes W165 and Auto Union Type E. The 512 used a flat-twelve DOHC engine with two-stage supercharging. Tested on the bench it had peaked at 370hp at 9000rpm while averaging 335hp at 8600rpm. That was considerably above the rumoured Auto Union target, giving cause to optimism in the Portello works. The car itself followed Auto Union lines by placing the fuel tank directly behind the driver and positioning the gearbox behind the back axle. The car's twin-tube ladder frame was suspended by wishbones at the front and a De Dion set-up at the back, on top of which low-slung, bulging bodywork was placed. The detailing was meticulous but also very time-consuming, especially since Italy was becoming more involved in World War II by the month. It is amazing, however, that development carried on well into the war and that the finished product was tested as late as 1943, although parts testing had already started in the summer of 1940. 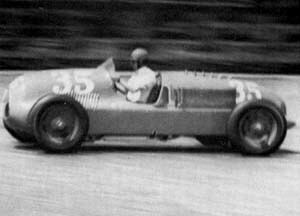 Some of the tests took place on the Milan-Varese autostrada, and it was on the early morning 19 June 1940, during one of these tests, that Alfa's faithful tester Attilio Marinoni was killed as his 158 carrying the 512 rear suspension hit an unsighted lorry during a takeover manoeuvre. Consalvo Sanesi, the mechanic-turned-tester, tested the car many times at Monza and predictably reported that it was a real handful. More tellingly, however, was his conviction that the Alfetta was quicker. On the other hand, Carlo Pintacuda was said to be much more flattering about the 512's road behaviour. In the end we will never know. Along with the other Alfa Romeos the 512 was stored in the famous cheese factory but the only thing the racing world heard of it in 1946 were its detailed design plans issued in an Auto Italiana article. Although post-war Alfa threatened to bring out the 512s as soon as the Alfettas got beaten, they never needed to and never did. And it remains to be seen if they would ever have been able to. Meanwhile over at the other side of the Atlantic there was at least the equal amount of experimenting going on. Although Indianapolis has often been portrayed as a conservative place, the main case for the prosecution being the USAC team owners’ continued faith in their front-engined roadsters into the sixties when their transatlantic rivals blitzed them with low, light and nimble rear-engined machines, the accusation is wholly unfair. In fact, the mother of all ovals has always been a breeding ground for all sorts of weird experiments long before they were ever pioneered in Europe – if ever. Six-wheelers, turbines, four-wheel drive, twin engines, offset driving positions – you name the innovation, Indy had them at a very early stage. Lee Oldfield’s DNQ didn’t stop another man from carrying the rear-mounted engine concept further forward one year later. Having left bankruptcy and the sorry failure of the Miller-Tucker company behind, Harry Miller’s innovative mind was sparked for a final time when the AAA adopted Grand Prix regulations for the 1938 Indy 500 and onwards. Now regarded a man of mythical proportions because of his sheer grandeur of thought, he ambitiously matched a rear-mounted engine to four-wheel drive, which he pioneered on his joint-venture with Bugatti in 1932. This followed up the aluminium-coloured front-engined 3.8-litre 4-cylinder ‘Four’ that he brought in March but was soon deemed unsuitable. Instead, all of Miller’s attention went into his latest folly, a four-wheel drive, all-independently suspended American Auto Union, with a canted short-stroke supercharged 3-litre 6-cylinder engine, side fuel tanks and all-round disc brakes. Like the Lee Oldfield Special it was hastily finished and way ahead of its time – and thus too failed to qualify. Although the car definitely had a sleek appearance it didn’t look as effective as the Auto Unions, probably because of the four-wheel drive’s forward propshaft forcing the driver to sit up really high. It made driver Ralph Hepburn sit on the car instead of in it. Nevertheless, Miller had managed to sway the Gulf oil company into supporting his effort, so the Gulf-Miller Sixes were back in 1939 for a threefold attack comprising George Barringer, Zeke Meyer and George Bailey. However, the Gulf association was the weak link too, as the oil company was eager to promote its street petrol, giving the six-cylinder engine a mere 245hp, while Miller’s old fours – now in the hands of Offenhauser – were pounding out 300hp by using Indy’s familiar alcohol-based cocktails. The three-car effort was soon reduced to one when Barringer’s car violently spun into the wall, causing a pannier fuel tank to explode. He was lucky to escape the fireball rotating back onto the track. The scary accident led to Zeke Meyer’s forfeit, and so the team was left with a single representative in the race, Bailey having qualified a very encouraging 8th. The car only lasted for 47 laps, however. It would be going from bad to worse the following year when Miller returned with three rebuilt Gulf-Millers. 1940 hero George Bailey wasn’t so lucky this time when his Six suffered a similar crash to Barringer’s. He was killed in the ensuing flames. 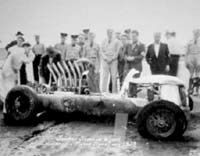 The two surviving cars were withdrawn, and while Miller’s health was deteriorating further Gulf decided to sponsor Barringer’s speed-record attempts in Utah. There, Barringer found the car’s four-wheel drive system well suited to the salt plains at Bonneville as he set an astonishing number of world records in the International Class D (2-3 litre). 1941 would see the car’s final fling at the Brickyard before Pearl Harbour would bring an end to motoring competition in the US. It would be equally disastrous, and heartbreaking to Harry Miller who died an unrewarded man two years later. For the 1941 Indy 500 the Sixes came highly modified after pannier tanks were banned in the wake of Barringer and Bailey’s fiery accidents. The cars now carried boxed steel side sections in which the fuel tanks were housed and cushioned. With Barringer and the unrelated Al Miller driving, they lined up 14th and 15th on the grid. That is, the 15th placed car never got the chance… Apparently the racing gods couldn’t let go of the idea that at least one Gulf-Miller should burn to bits of scrap and ashes each year, and this time fate struck on race morning when a garage fire turned the Miller pit area into a blazing inferno. 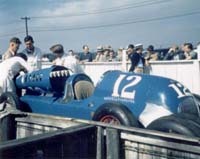 Al Miller’s No.12 car was salvaged and helped onto the grid but after multiple ignition problems its engine seized after a mere 22 laps. That was the bitter end to the pre-war Miller adventure. As soon as the war ended more rear-engined contraptions of the weirdest kind would rear their ugly heads at Indy, including a rechristened Gulf-Miller, while in Europe there was more experimenting before the 500cc Cooper idea made its way to Grand Prix racing.